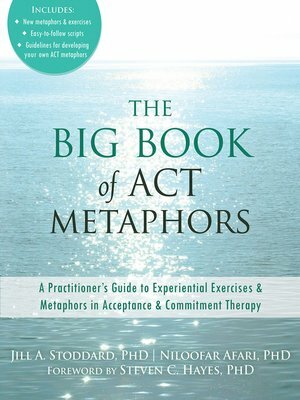 Metaphors and exercises play an incredibly important part in the successful delivery of acceptance and commitment therapy (ACT). These powerful tools go far in helping clients connect with their values and give them the motivation needed to make a real, conscious commitment to change. Unfortunately, many of the metaphors that clinicians use have become stale and ineffective. That's why you need fresh, new resources for your professional library. In this breakthrough book, two ACT researchers provide an essential A-Z resource guide that includes tons of new metaphors and experiential exercises to help promote client acceptance, defusion from troubling thoughts, and values-based action. The book also includes scripts tailored to different client populations, and special metaphors and exercises that address unique problems that may sometimes arise in your therapy sessions. Several ACT texts and workbooks have been published for the treatment of a variety of psychological problems. However, no one resource exists where you can find an exhaustive list of metaphors and experiential exercises geared toward the six core elements of ACT. Whether you are treating a client with anxiety, depression, trauma, or an eating disorder, this book will provide you with the skills needed to improve lives, one exercise at a time. With a special foreword by ACT cofounder Steven C. Hayes, PhD, this book is a must-have for any ACT Practitioner.